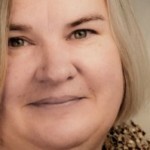 The Chief Milkmaid | And then there was PIE. 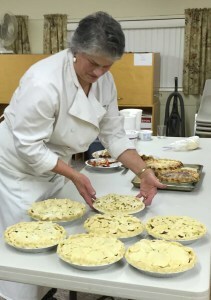 Shirlee Read of The Kitchen Door makes pies and other goodies for the Bayview Farmers Market. The minute I learned about her pie class I knew I had to sign up. I’m grateful I was so decisive because it quickly filled up. The class was so popular Shirlee decided to extend it to a second session on the next day. The holiday season is certainly upon us. In our family the holiday season actually starts the week before Halloween (my daughter’s birthday) and runs through January 2. By the time Thanksgiving comes along we are primed for the delightful gratitude and gluttony of the holiday. This year I decided to celebrate a little differently. Instead of ordering pies this year, I decided to make them myself. The only problem was—as accomplished as I am as a cheesemaker, candymaker and even a baker and cook—I don’t make pies (at least not unless it has a graham cracker crust, the only crust I’ve been successful at creating). But this year I was enrolled in a Pie Making Class. I arrived at the Deer Lagoon Grange at 1:30 p.m. on Nov. 16 for the class. I showed up a little early in case Shirlee needed a hand. She didn’t. She welcomed the company, but it was clear she is a pro and had things well in hand. Shirlee teaching and cooking. All of us smiling! One by one the other students arrived. The class included many types of folks, from a young Georgia orchard farmer (Think Georgia PEACHES! I knew we would become friends) to retirees enjoying this new phase of their life on Whidbey Island. 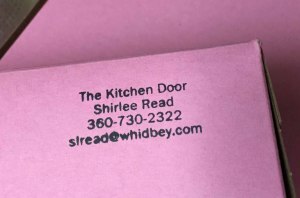 We sat down with coffee, tea and pie to sample some of Shirlee’s expertise and to learn a bit about each other, why we were there and what we could expect from the day. 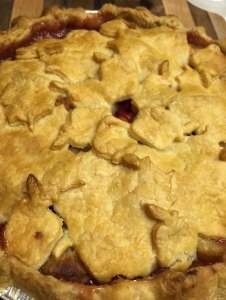 I should just add a note here about her raspberry/rhubarb pie—WOW! “Baby’s bottoms,” we learned, are very important for making pie. 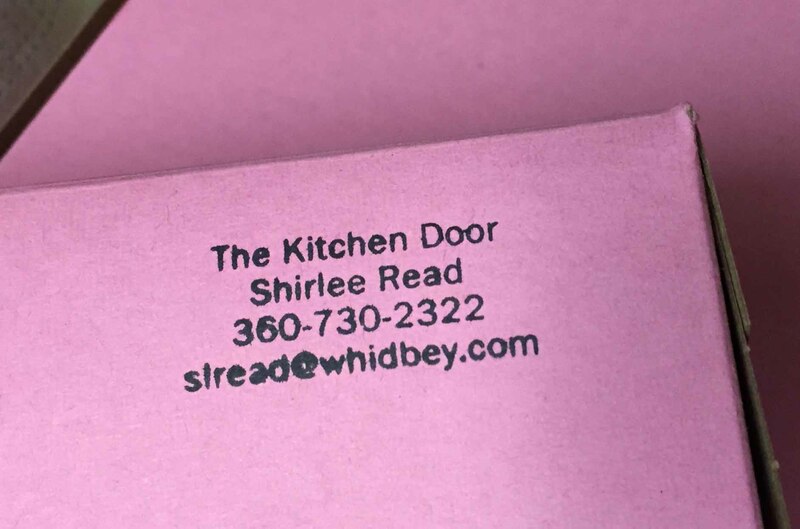 Once Shirlee had given us the basics we went to the kitchen. She helped us prepare some fillings for some savory pies and taught us some tips and tricks. Then we got to practice what she showed us. 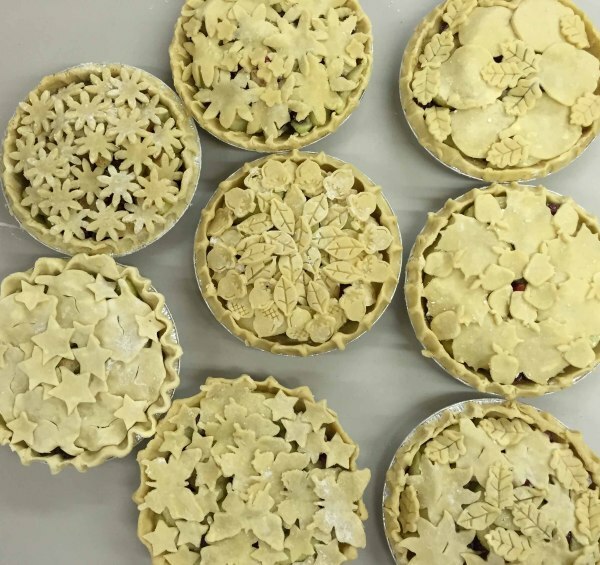 Shirlee made these beautiful round pie crusts, set them in the pans and created the crust designs in moments. She did it again and again, while we laughed and cheered at how easy this process would be. The laughter and chatter got a bit more boisterous as we tried to duplicate the simple dough mixing and rolling (not one of us got a circle on the first try) techniques. Fortunately Shirlee was there to coach us and sometimes coax us into creating the almost perfect pie crusts. And “baby’s bottoms,” we also learned, take more than a bit of practice. By the second crust we all still needed hand-holding. But by the third crust… well, let’s be honest, we still needed a bit of input to make a great crust. But we did it. We rolled out crusts, flour flying! Shirlee took eight self-admitted pie flunkies and coaxed beautiful, delicious pies out of us, pies that we could all comfortably claim we made. 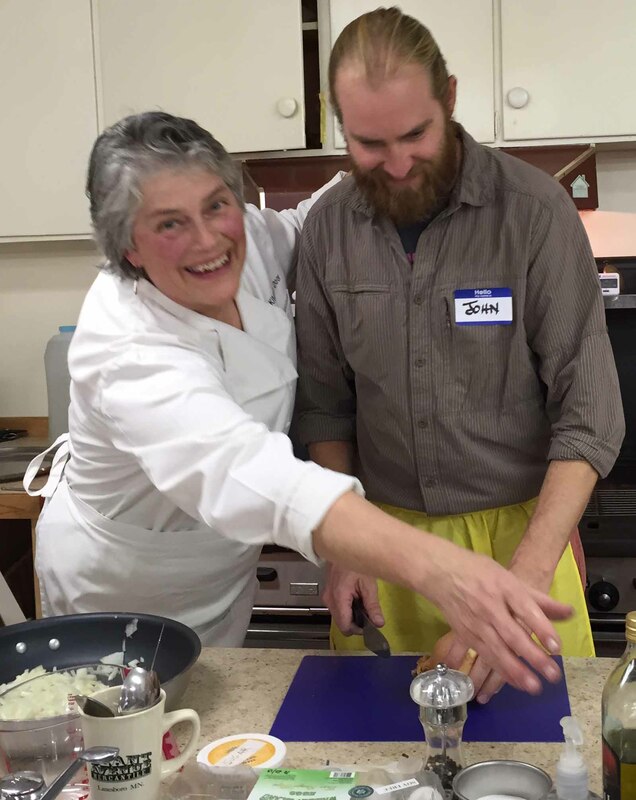 We learned techniques that were repeatable in our home kitchens. We learned ways to adjust recipes to our personal preferences. 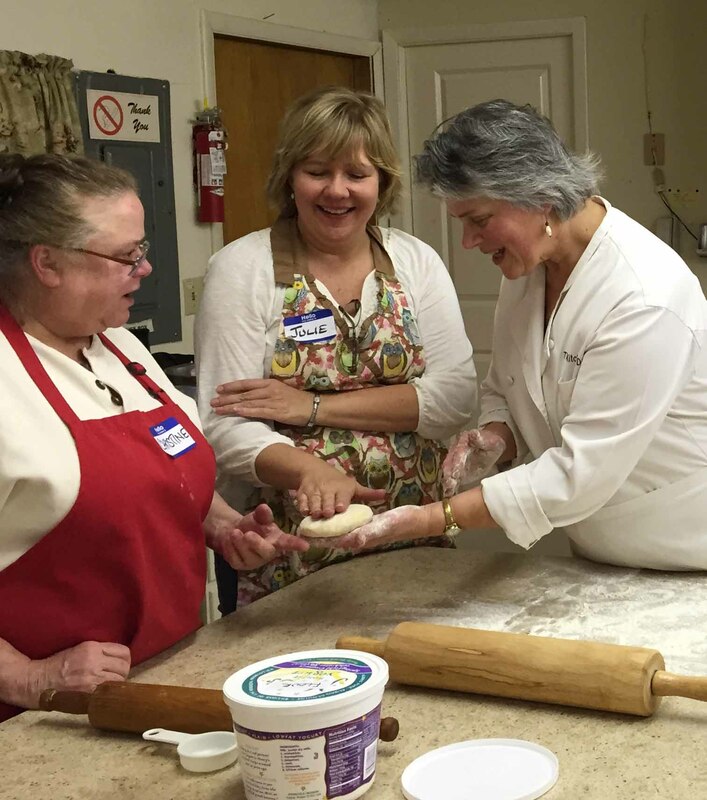 We learned tricks from cutting onions to creating flaky dough. Shirlee reviewing her students’ work. And then we sat once again, to eat. We enjoyed a delicious dinner featuring savory pie, a fresh salad, a glass of wine to toast our respective successes and each other’s company. 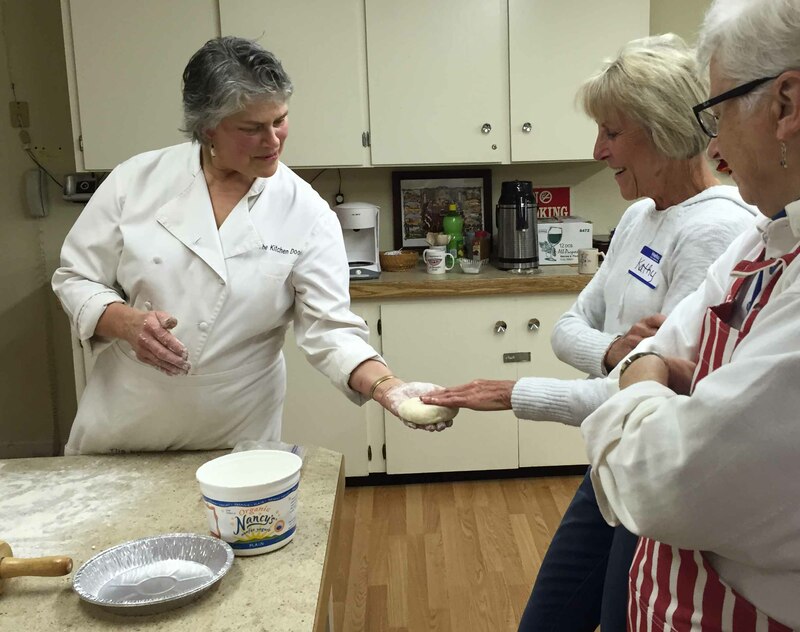 The class felt more like an afternoon spent with friends in the kitchen than structured class. That is the beauty of a gifted teacher. Shirlee kept the class running smoothly forward, engaging and informative. We all achieved our objectives. 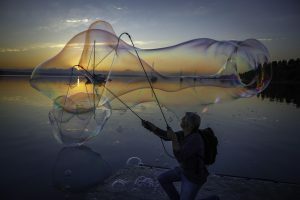 We learned more than we had expected to, in a way that we barely even realized we were learning. 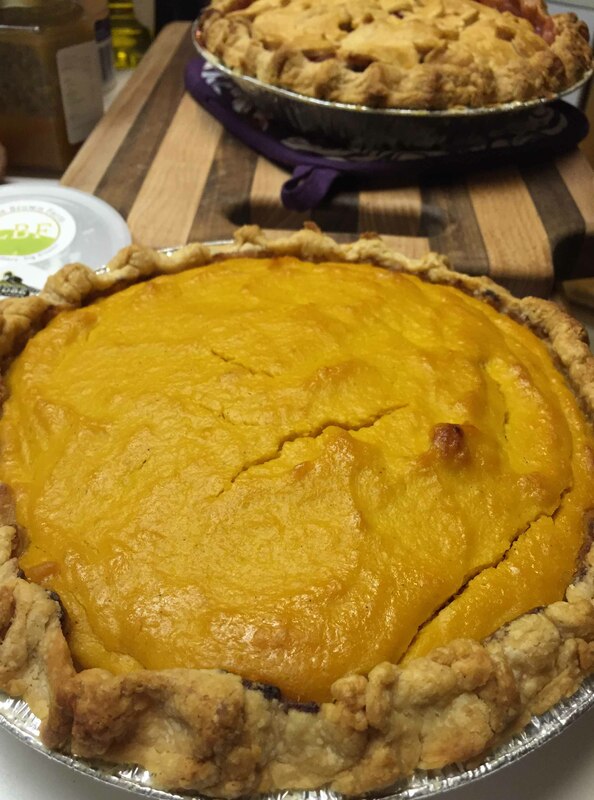 Luckily for me Shirlee is still making and selling her pies at Bayview Farmers Holiday Market in the greenhouse at Bayview Farm & Garden (Saturdays 10-2 through 12/20/14). 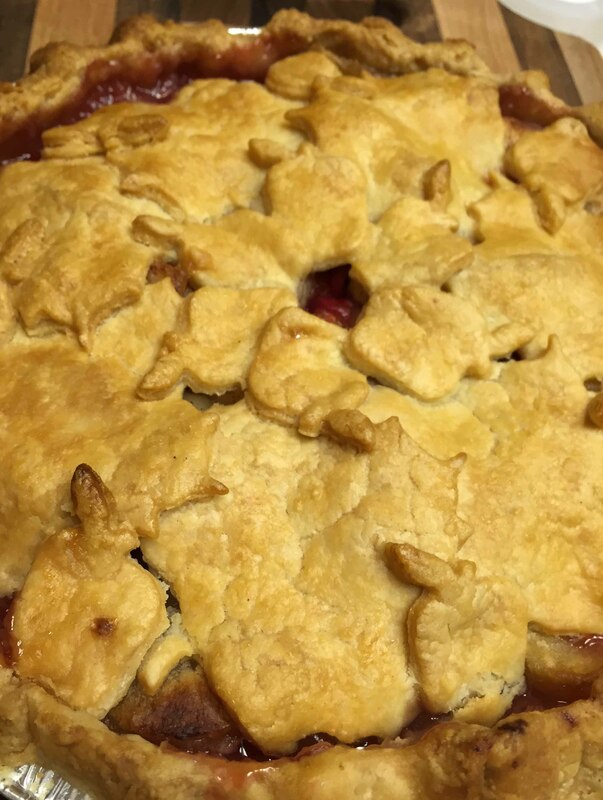 Apple Cranberry Pie – I made! I enjoyed making pies with the class but am happy to know that I can simply purchase them as needed from The Kitchen Door. Her slogan is “Pies for Breakfast, Lunch and Dinner!” Having enjoyed her pies for each of those meals, I can heartily endorse that idea! There are so many interesting classes available in our beautiful community. I encourage you to avail yourself to the riches of this remarkable Island. They are available in all budget ranges, all skill levels and everything from cheese to ceramics… and of course, pie. You can find classes in the Whidbey Life Magazine calendar. When you do see a class you want to take, sign up fast, they are often small and fill up quick! My reward: I ate both of these slices! Pumpkin pie crust made in class, filling made from Willowood pumpkin, LBF chevre, honey and eggs. Delicious!